Over the past 2 years I have been working on one of my favorite personal artistic projects of my careers, Waterfalls of New England, which has since taken me all around the area to some of the more remote and distant hidden gems of the forest that many people never see or know of their existence. It has been a project more fulfilling and rewarding than I ever would have imagined going into it, and it’s one that I will talk about a whole lot more in upcoming posts. In some ways the project is a whole new venture, but in many ways its just a honing in and focus on many of my favorite subject elements to work on. As a photographer i’ve traveled a whole lot, mostly on commercial projects and sports assignments, but also on artistic ventures that have made seeing new places more rewarding and fulfilling than they ever would be otherwise. One of the big things that shined through when starting this project and continues to resonate today is how thinking locally is often the based way to tackle pursuits within the art world. Sure there are more recognized places than the spots within the New England states, ones with more marvel and dramatic size, and sure there is a long list of places I hope to travel to and work within during the coming years, but I really have a fondness for chasing work in these areas because its home, its beautiful, and in many ways, New England does compete with anywhere in the world when it comes to artistic beauty. I like to think that knowing the area has given me an upper hand with knowing where to go and what to look for when making these pictures, and looking back at it now its certainly knowledge that pays off and grows over time. 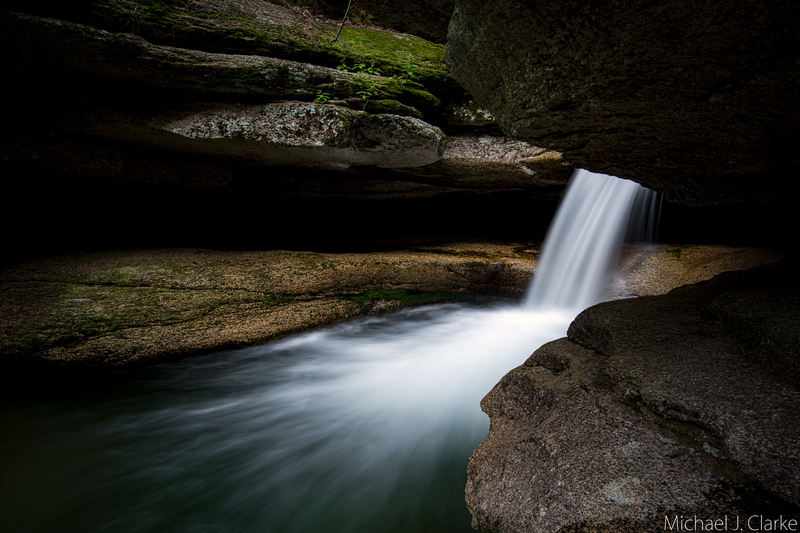 Sabbaday Falls is a twisting waterfall formation along New Hampshires White Mountains region that is one of my favorites and was a starting point and launching pad for this project. The waterfall itself is simply beautiful, and is a rare formation and combination of features that is about as unique as anywhere in the world. Resting along the middle of gorgeous Kancamangus Highway, the waterfall is a fairly short hike away from the road and it’s approach begins with the lower tier of the 3-section waterfall. Seen above, the lowest section is a roaring short cascade that flows between a carved rock canyon and into the pool and river below. It’s a stellar display of cut rock that has formed over many thousands of years of water ripping between the two seams of White Mountains granite. As pretty as the lower section is, the glory of Sabbaday lies ahead on the trail, as the next formations are seen after ascending about 30 feet up the cliffs where the top tiers come into view. As you can see, the middle and upper sections of the waterfalls are both visually stunning as well as extremely unique within nature. The middle section of the waterfall is a 20+ foot expanding cascade, with a punchbowl pool above that forms the start of the formation. You can see some of the bridge construction build beside the waterfall in the overview, and it has been constructed with care and allows for awesome exploration of the scene without getting in the way of its beauty. As cool as the formation is as a whole, its the punchbowl at the top of Sabbaday that strikes me as one of its profound features. With careful safety considerations I have explored several of the plunges different views, and they are about as glorious as the natural world can be. The view from inside the punchbowl is a stunner, and shows the jet of water that blasts from the river above and supplies all of the natural formations below. The punchbowl is an enclosed cavern with naturally carved walls and a deep and swirling pool that makes for a rare formation in these parts of the country, but really amongst the whole planet. This formation is what makes Sabbaday such a gem, and its one of my favorite natural studios to explore within and share with the world.